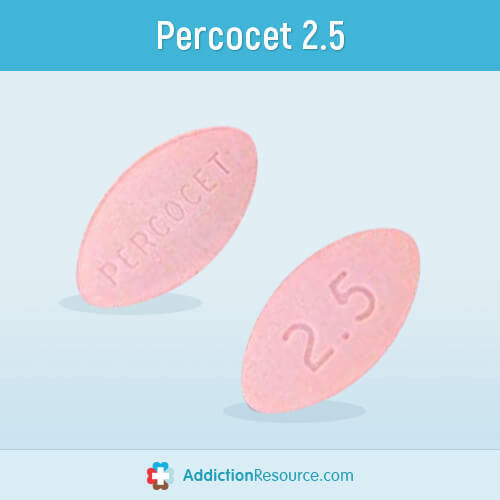 Percocet Pill Identifier: What Color Do Percocet Pills Come In? 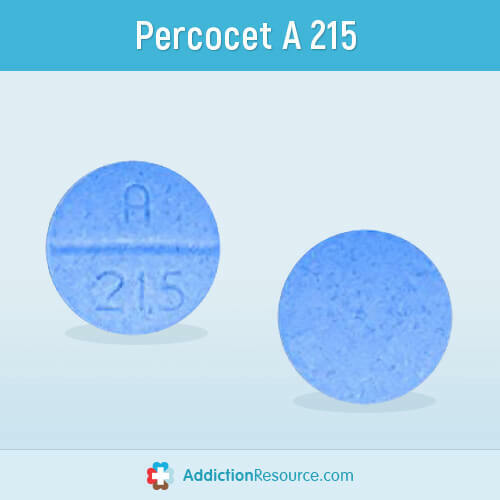 Percocet Pill Identifier: What Does Original Percocet Look Like? 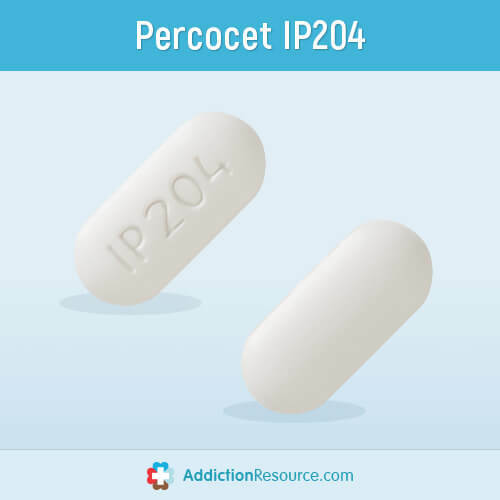 Percocet is available in different forms such as liquid and tablets. The brand name product is available only in tablet form, while oxycodone and acetaminophen, when sold as liquid are called Roxicet. Tablets come in various strengths from 2.5/325 mg to 10/650. It is possible to identify the original Percocet pill by its color, shape and the embossed number on the surface of the tablet. How do Percocet Pills Look? What are the Strongest and Weakest Percocet Pills? How to Identify Fake Percocet? What Does Percocet Pill Look Like? What Does a Percocet 10 Look Like? 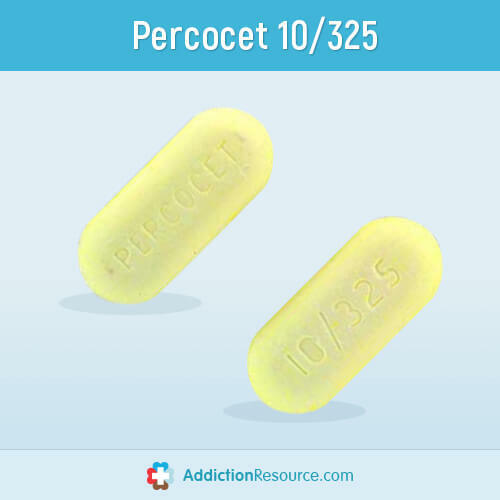 Yellow Percocet dosage has 10 mg of oxycodone and 325 mg of acetaminophen. On the one side, it has a drug name print, and on the other side 10/325 are printed. Endo Pharmaceuticals, Inc manufacture these tablets. This dosage strength is used to treat severe or chronic pain. 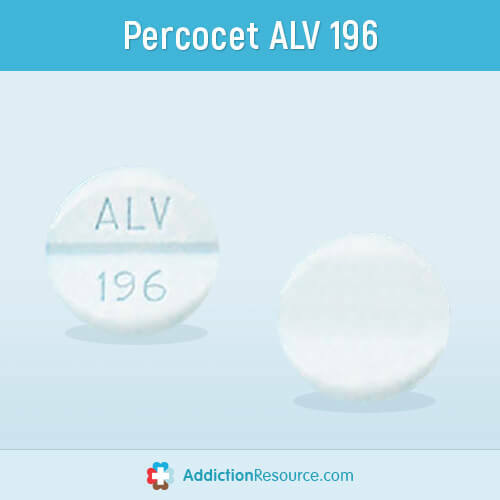 It is advisable to look for safer Percocet alternatives if the patient’s condition allows. Blue pill has 5/325 strength and presents with a round, tablet-like appearance. On the one side, Percocet 5 is printed while the backside presents with a line that divides the pill in half. Endo Pharmaceuticals, Inc manufacture the blue pill. Orange pill presents in 14 mm-sized capsules. On the front side, the drug name t is printed while the backside has the dosage 7.5/325 is printed. Endo Pharmaceuticals, Inc manufacture the orange 7.5/325 pill. 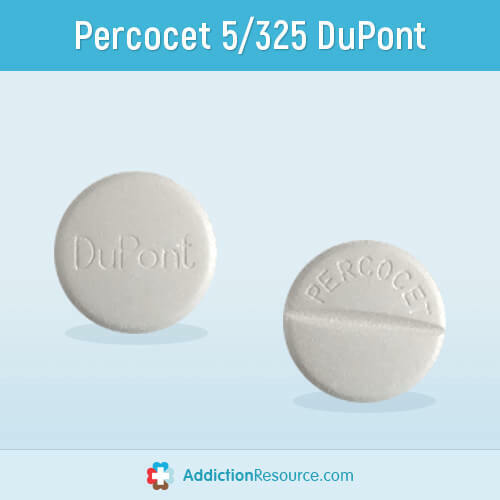 Percocet 5/325 is present in a white tablet form. On one side is printed, “DuPont” while the flipside has the drug name written on the top half. Endo Pharmaceuticals, Inc manufacture the 5/325 pill. This is the lowest existing dose. 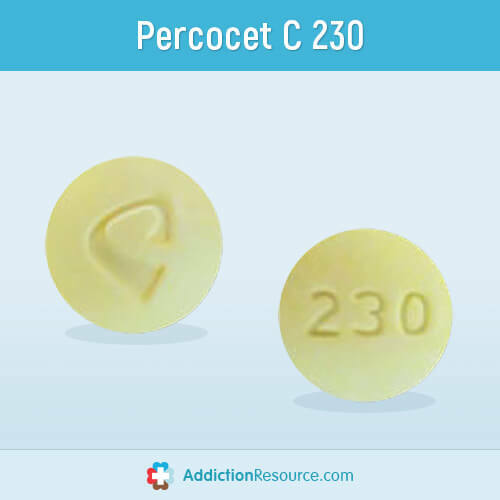 It is usually used as a starting dose or during the withdrawal period, because of the time this Percocet stays in the system. It contains only 2.5/325 mg dosage. It is present with an elliptical shape. On the one side, the drug name is printed while on the backside is a number 2.5. 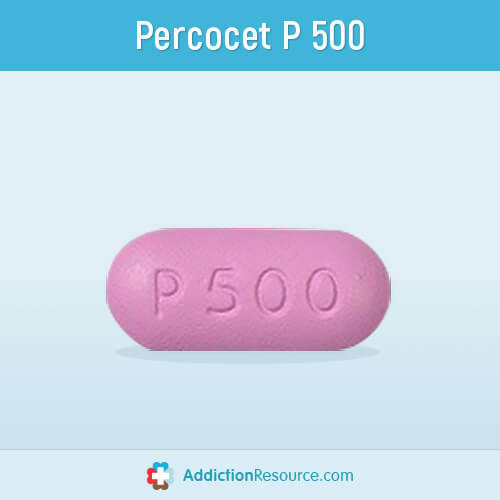 It must be noted that this is different what is commonly known as the pink Percocet or K56. This is a generic oxycodone/acetaminophen drug present in a white tablet form. On one side, “512” is printed while the other side shows a line dividing the tablet into two. This version is available in 325 mg/5 mg strength. The pill is present as a white tablet. On the one side, there is a line that divides the tablet into halves. On the top half, the A letter can be seen. 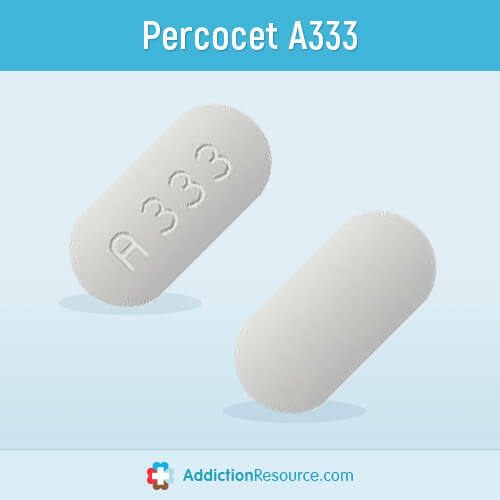 On the lower half of the a349 Percocet is imprinted 349. This pill is manufactured by Actavis Elizabeth LLC. This is a pink pill. Technically, this prescription drug labeled as Acetaminophen and Propoxyphene Napsylate and is available in 500 mg/100 mg dosage. This drug is manufactured by Pliva, Inc.
Technically labeled as Acetaminophen and Oxycodone Hydrochloride, the pill is available in 325/10 mg dosage. The manufacturer is Alvogen, Inc. The pill is technically labeled as Acetaminophen and Oxycodone Hydrochloride. This drug is present in a 12 mm-sized white tablet form. On the front, there is 4839 written on the top half with a “v”-like symbol imprinted on the lower half. The backside is clear. It is available in 325 mg/5 mg dosage and is manufactured by Qualitest Pharmaceuticals, Inc. The tablet is labeled as Oxycodone Hydrochloride and comes in a 30 mg blue tablet. 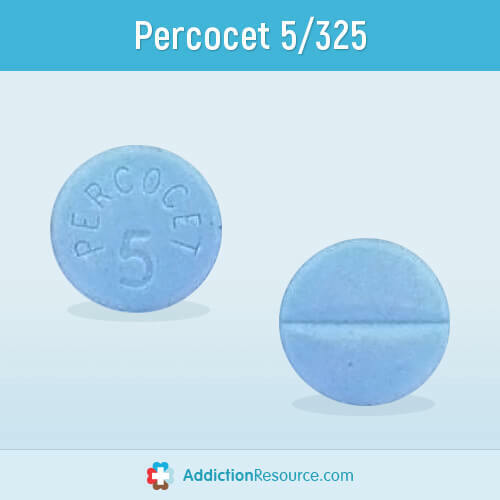 The front face of this drug, which is sometimes also called as the blue Percocet 30, is present with a line dividing the top and the bottom half with A letter imprinted on the top and 215 imprinted at the bottom. This drug is manufactured by Actavis Elizabeth LLC. 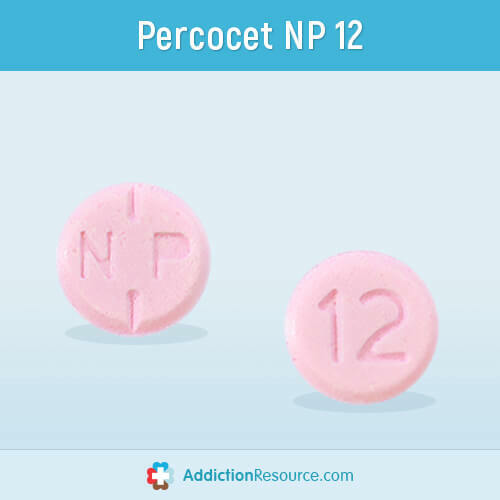 NP 12 pink pill is classified as Oxycodone Hydrochloride. This drug is present as a pink tablet with NP written on one face and 12 written on the opposite side. Zydus Pharmaceuticals is the manufacturer behind this drug. Technically classified as Acetaminophen and Oxycodone, is available at 325 mg/5 mg. The blue alv 196 is manufactured by Alvogen, Inc.
Percocet 10 a333 is technically classified as Acetaminophen and Oxycodone Hydrochloride. It is available at a strength of 325 mg / 10 mg. The manufacturer is Actavis Elizabeth LLC. The is present as a 15 mm pill with “M367” imprinted on one side, and a line dividing the pill into two at the back. 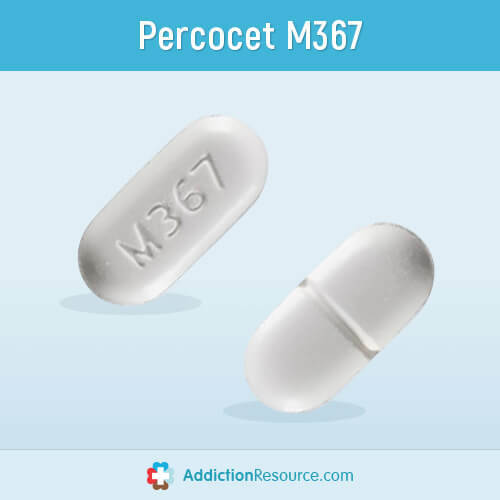 The m367 pill Percocet is available in 325 mg / 10 mg dosage. This drug is manufactured by Mallinckrodt Pharmaceuticals. The is technically classified as Acetaminophen and Oxycodone Hydrochloride and is available at strength 325 mg/10 mg. The drug is present as an 11 mm-long white pill with “IP204” imprinted on one side and a blank backside. This drug is manufactured by Amneal Pharmaceuticals. 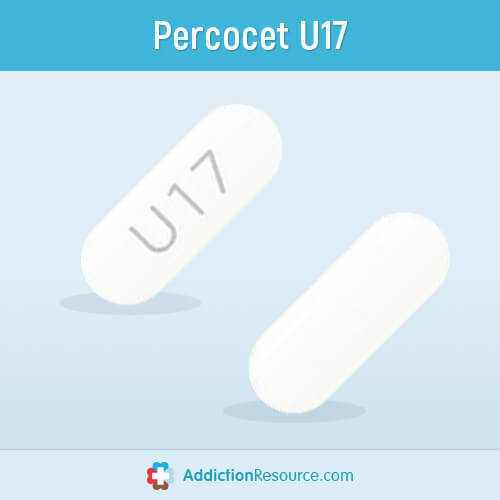 U17 is technically classified as Acetaminophen Oxycodone Hydrochloride. It is present as a white pill with “U17” imprinted on one side and a blank backside. The is manufactured by Aurolife Pharma LLC. The is classified as Acetaminophen and Oxycodone Hydrochloride. It is available in strength of 325 mg / 5 mg and is present as a white pill with “U15” imprinted on one side. 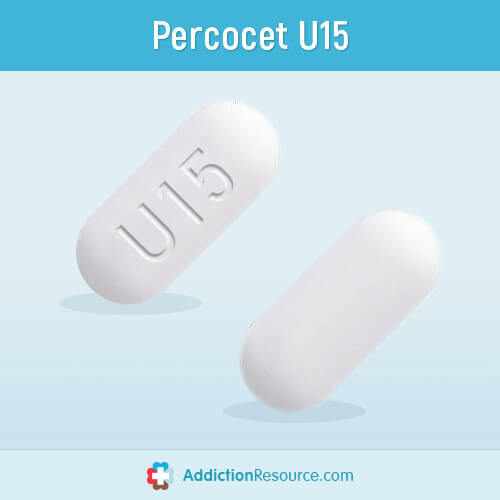 Percocet u15 is manufactured by Aurolife Pharma LLC. 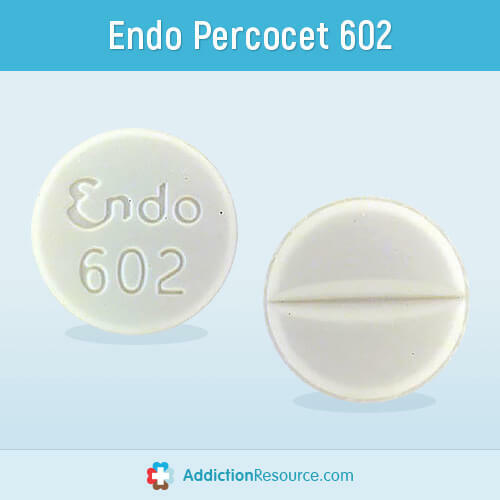 This tablet better known as Endo 602, is classified as Acetaminophen Oxycodone. It is present as a tablet form with “Endo 602” written on one side and, on the backside, is a line drawn that halves the tablet. This drug is manufactured by Endo Pharmaceuticals, Inc. 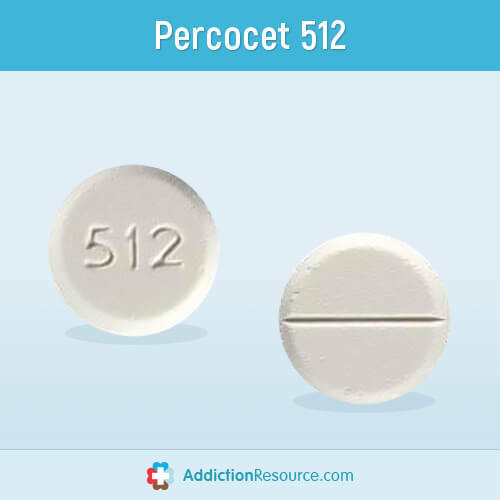 Sometimes termed as Percocet 543, appropriately called as Roxicet 325/5 mg is classified as Acetaminophen and Oxycodone. The drug is present in a tablet form with 11 mm diameter. On the front face are written, “54” on the top half and “543” at the bottom half. 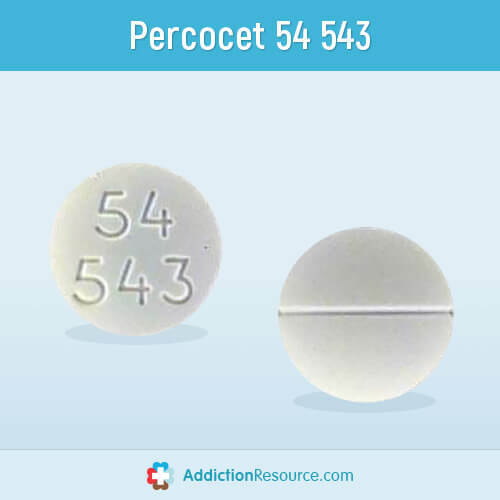 The 54 543 pills are manufactured by Roxane Laboratories, Inc.
What are the Strongest and the Weakest Percocet Pills? The lowest possible strength for this painkiller is 2.5mg/325mg. Doctors are often advised to give patients the lowest effective dosage possible. Some of the factors that the doctor will look into before determining the dosage include addiction risk factors, type of patient’s pain and previous experience with analgesic medications. The strongest tablet contains 10mg/650mg of oxycodone and acetaminophen. It is imperative that the patient adheres to the prescription given by the doctor because a higher dose of the drug can result in severe Percocet side effects as well as opioid abuse from this drug has been widely reported. 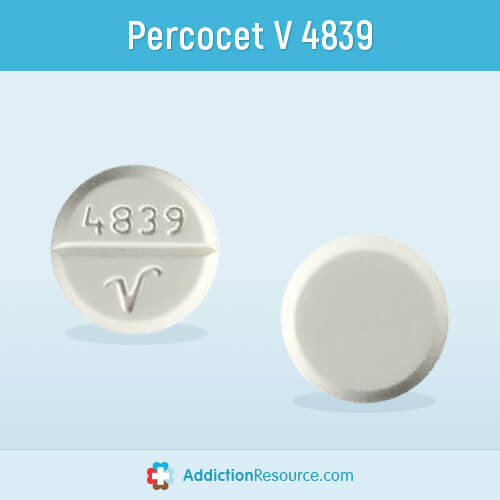 Street value of Percocet is high among a lot of states, that’s why it is often got tampered. Fake drugs usually bring serious health risk to its consumers, especially when consumers using them in another way, then prescribed, for example, snorting Percocet. The story on Fox News said that Illegally made medicine has an extremely high risk of getting OD on Percocet and can cause death for its users. Sometimes fake drugs might look similar to the original one, but fakes can be mixed with cocaine or heroin. Sometimes fake Percocet ingredients are mixed with fentanyl. Criminals often sell counterfeit drugs in powdered form to make it harder for consumers to identify the fake. Although there are many similarities between the fake and original drug care should be taken when purchasing the medication. Look at the texture of the pill. Real tablets have a uniform speckle. However, the fake tablets have larger specks. On the counterfeit tablets, numbers and imprint are not stamped as deep as on originally manufactured. Fakes can have an imprint that is different from the original. 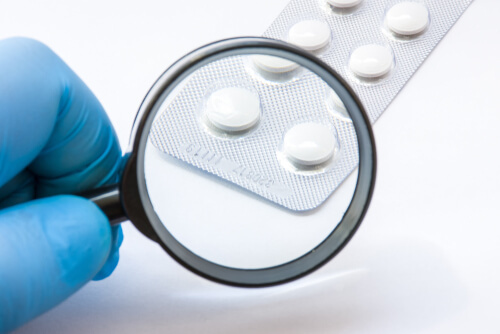 Counterfeit tablets with “TEC” imprint were recently detected in Canada. When the painkiller is dropped in the water, there should be no color change. However, if the color changes to yellow you are dealing with a counterfeit product. Pills that are laced with heroin often smell like vinegar. However, the original medicine does not have a vinegar-like smell. 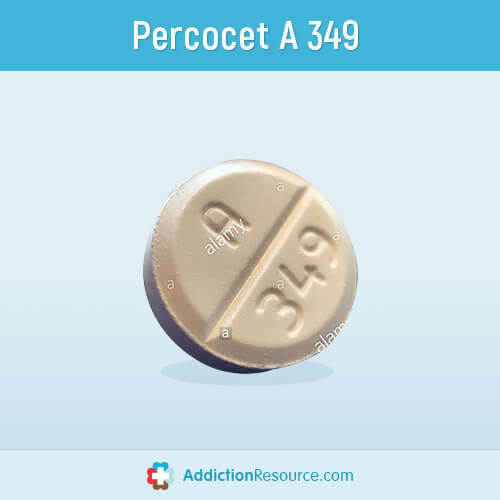 If you or your loved one has any questions about Percocet medication, please call (888)-459-5511 to speak to a professional who will answer all your questions with utmost sincerity and confidentiality at any time of the day. 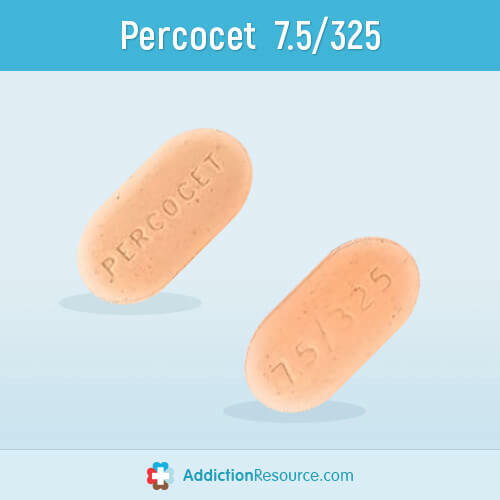 Addiction Resource » Addictive Substances: The Anatomy of Drug Addiction » Percocet Addiction and Abuse Signs: How Long Does it Take to Get Addicted? » Percocet Pill Identifier: What Does Original Percocet Look Like?